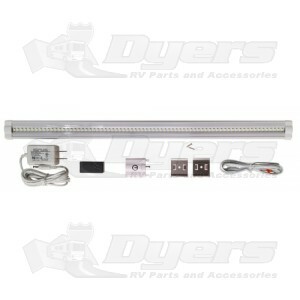 Great for kitchen, bedroom, bathroom, or utility areas, this slim line LED utility light features a wide beam angle. Easy installation includes a touch dimmer feature with on/off function as well as multiple dimming levels. This light works on direct 12v power or includes a 110v convertor for AC plug in. 19" x 2" x 0.3".